UltraSoC’s embedded analytics technology provides a powerful platform for developers who need to ensure the security and functional safety of their products – particularly in the automotive industry. Our semiconductor IP can improve verification and validation during product development; and it can be used in deployed products to spot both systemic and random errors, providing a new level of safety functionality, and allowing in-field system health monitoring and advanced forensics. UltraSoC recently launched the UltraSoC Lockstep Monitor, which is a hardware-based, scalable solution that significantly helps functional safety by checking that the cores at the heart of a critical system are operating reliably, safely and securely. UltraSoC’s flexible IP supports all common lockstep / redundancy architectures, including full dual-redundant lockstep, split/lock, master/checker, and voting with any number of cores or subsystems. Click to read the full news announcement. UltraSoC and ResilTech announced a collaboration in October 2018 that brings together their expertise and technologies to further the functional safety compliance of automotive systems, focusing particularly on the ISO26262 standard. UltraSoC’s embedded analytics technology provides a powerful platform for developers who need to verify and validate the security and functional safety of their products, and to incorporate hardware-supported safety and security features such as anomaly detection and prevention of malicious intrusion. 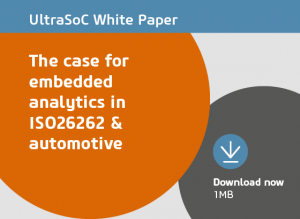 The UltraSoC embedded analytics infrastructure is independent of the main system and non-intrusive, and so can be deployed as a Safety Element out of Context (SEooC) in ISO26262 terms. It provides information and analysis that allow designers to more easily satisfy the functional safety, risk assessment, testing, reporting and traceability requirements of standards such as ISO 26262, IEC 61508, EN50126/8/9 and CE 402/2013. In the same way, we also facilitate the move to security standards such as SAE J3061. Edition 2 of ISO26262 includes more detail on requirements for semiconductors, in the form of a new “Part 11”, including ISO/PAS19451. With the move towards ever more safety-critical functions, such as automated driver assistance systems (ADAS), these requirements are becoming ever more important. Lockstep monitor, allowing consistency checking between redundant modules. The monitor is CPU-independent, requiring no native support, and can be extended to other error tests and voting systems. Bare Metal Security, providing a hardware-based level of security “below the operating system”. BMS is extremely difficult for an attacker to detect or subvert, and supports the requirements of SAE 3601 cybersecurity for automotive. Click here to watch UltraSoC Chief Strategy Officer Aileen Smith interview with Design and Reuse on ‘Embedded Analytics and Automotive Security’ at the D&R IP SoC Days 2018 event in Santa Clara.